Despite ongoing global pollution, researchers have discovered that levels of mercury in seabirds off the coast of B.C. have remained relatively stable over the past 50 years. Surprisingly, mercury in seabirds is now actually slightly lower. This might appear to be good news, but unfortunately it is due to a decline in fish stocks near the surface which has forced seabirds to change their diet, and in the process to feed in areas low in bacteria (known as sulfate-reducing bacteria) which act to control the levels of mercury in their bodies. Although tiny, bacteria can be very important--try to make yogurt or miso soup without them. Now, researchers at McGill University and Environment and Climate Change Canada have discovered that bacteria play an important role in determining the health of birds at the top of the food web. By using isotopic tracers called stable isotopes, researchers showed that seabirds feeding in areas rich in sulfate (a chemical that is an important food for sulfate-reducing bacteria that help break down organic matter) had high levels of mercury. Those same sulfate-rich areas were favoured by the sulfate-reducing bacteria which produce methylmercury, a toxic substance which is then taken in by the fish that eat them and eventually by the seabirds that feed on the fish. The authors of a recent paper published in Environmental Science and Technology used seabird eggs collected along the Pacific coast of Canada over 47 years, and archived by Environment and Climate Change Canada in Ottawa. They documented a decline in mercury levels for several seabird species over 47 years. However, they traced that decline to a dietary switch from high-sulfate, mercury-rich fish to low-sulfate, mercury-poor fish. Thus, there was no overall change in mercury levels. Seabirds in British Columbia's Salish Sea changed their diet over the past 47 years, switching from fish that live relatively close to the surface, to bottom fish. Over that period, forage fish living close to the surface, such as Pacific herring, have declined. The research is particularly relevant because two of the cormorant species being studied have declined rapidly over the past 40 years. Most evidence to date suggests that the decline is due to increasing eagle populations, which prey on the young and eggs. However, the switch in diet may also play a role as adult birds work harder now that there are fewer forage fish. "Wildlife are impacted by many different stresses" explains Dr. Elliott, from the Dept. of Natural Resource Sciences at McGill, who is the lead author on the paper. "More predators, dwindling fish stocks and mercury pollution are just some of the variables impacting seabird populations. 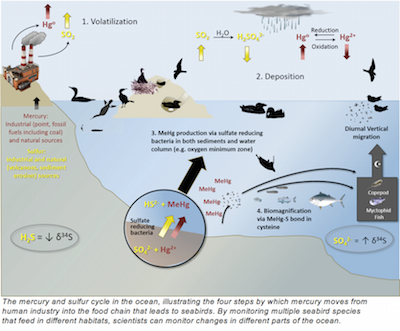 Fortunately, we found that the level of sulfate-reducing bacteria explained much of the variation in mercury, suggesting that bacteria provided a sort of buffer to variation in mercury within the environment." "We are becoming increasingly aware that bacteria play an important role in the health of marine ecosystems," says Elliott. "Recent studies have shown that wildlife need healthy microbiomes to power long-distance migration. What we discovered was that sulfate-reducing bacteria also control mercury levels. Clearly, what is happening at the base of the food web reverberates up to the top of the food web."